As most of you would have already known, buying a car in Singapore can be a very daunting and tedious process, especially if you are doing so for the first time. Some confirm chop questions that potential car buyers will definitely face: Which brand? What’s the depreciation? When was the registration date? More importantly, how much is it going to cost me? Singaporeans are spoilt for choice when it comes to the sheer number of cars available in the market. But the real question is how do we find the perfect one that best suits our needs and wallets? Introducing the Carousell Autos home screen, a newly upgraded feature within the Carousell app. The new Autos home screen aims to provide you with a one-stop hub for all things auto-related – find a car for sale, rent one, or accessorise your current ride. 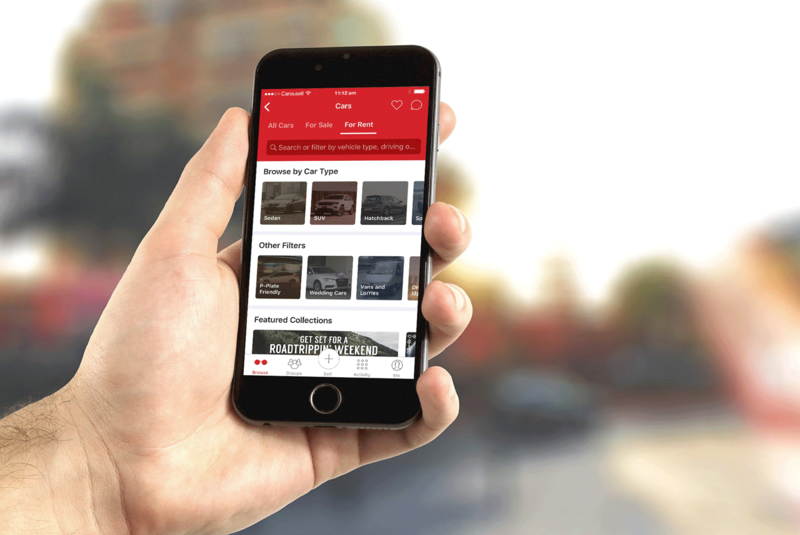 In addition, with over 160,000 automotive listings attracting over 500,000 views per week, our new and improved search filters will redefine your browsing experience by helping you find what you need in just two taps! Once your app is updated to the latest version, you are all set to go! Tap on the Cars icon on the main Carousell app and do you notice anything glaringly different? That’s right! Gone are the days where you immediately see a whole lot of listings when you tap into the cars category. Introducing “an app within an app” experience, where you can now navigate through the cars category with ease, enabling you to find what you are looking for instantly with just a few clicks. We’ve made it simpler for you to narrow down quickly to what you have in mind. Tap on the ‘For Sale’ tab, and you will be able to see all the major brands already categorised for you. Say for example, if you are looking for an Audi car, simply tap on the Audi icon to browse all the available Audi listings on Carousell. Buying a car? Choose to browse by make or even body type! Play around with the budget filters to find a car that you can afford! Have something more specific in mind? Now, let’s say I am looking for a Audi A4 with a budget of $120,000. Simply tap on the search bar, type in Audi, and you will see a whole list of suggested Audi models. Set the price filters to help narrow down cars within your budget! Choose the Audi A4 and set your budget and depreciation in the fields provided to further narrow down your search criteria to the range that is most comfortable for you and your wallets. Super fast and simple isn’t it? Browsing for cars is also more fun now as you can even browse by body type, price range and other relevant and super applicable filters such as, direct owners only, family cars and popular Japanese cars and more! It is a dream for many of us (including me) to be able to own a car one day but as the saying goes, owning a car in Singapore is a luxury that not many can afford. Thankfully, you could still rent a car at a fraction of the price! Now this might interest you if you have plans to rent a car. With the newly improved Autos home screen, renting a car is made simpler too! We understand that as more and more Singaporeans are turning to car rentals for a variety of reasons and occasions, we have customised the category of car rentals to suit your needs. For instance, if you have a group of guests visiting you in Singapore and you would like to bring them around, browse easily by car types! Big group? Choose an MPV! Small group? Check out the range of Sedan or Hatchback cars available with just a tap of finger. Additionally, we have also customised shortcuts based on some of the popular reasons for renting a car. Now you can easily look for cars that are P-Plate friendly, cars that allow you to drive into Malaysia and even potential wedding cars! Once again, all these within a tap of a finger! What do you look forward to most when it comes to shopping? For me, definitely special promotions and deals! Duh, who doesn’t like promos and deals! With the new Autos home screen, don’t miss out on these specials deals and promotions with strategic partners to enhance your car buying journey. Also, keep a lookout for weekly themed collection of cars that are specially curated by the Carousell team to suit your needs in the cars for sale and rental cars categories specifically. With these improvements, we hope to make it easier than ever for you to fulfill your autos needs. Share this exciting piece of news with everyone you know whom are looking to buy or rent a car! Got any questions? Simply leave a comment below! We’d definitely love to hear from you. Thanks for reading! Don’t forget to update your app if you have not done so! Also, if you are into properties, check out the newly revamped properties category here!